Well, I've been missing for about a week now and I hope everyone hasn't given up on me cuz, I'm back! I didn't go on vacation, but have had a lot going on, plus I had jury duty! I had never served on a jury before, so I found it interesting, very interesting. It was all this week and I was released last evening. I haven't cooked much this week, but I have this yummy recipe that I tried today. 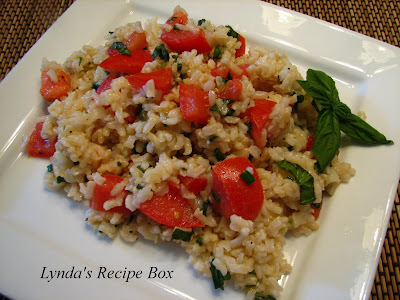 I've been looking for more brown rice recipes,and found this Brown Rice, Tomatoes and Basil recipe from Ina Garten on Food Network. It's a delicious and refreshing dish that is supposed to be served room temperature, but it's yummy cold too. Made with fresh, home grown tomatoes gives it amazing flavor! I used half of the basil called for as I thought it would be too strong. I also added some fresh chopped chives, and next time I'm going to add some green onions, as I like a bit of crunch in my food! This is a delicious and healthy dish, so try it! Bring 2 1/4 cups water to a boil. Add 1 tsp. kosher salt and brown rice and bring to a boil again. Cover pan and simmer rice on low heat for about 30-40 minutes until rice is tender and water is absorbed. Mix together vinegar, sugar, olive oil, 1 tsp. kosher salt and a pinch of black pepper. 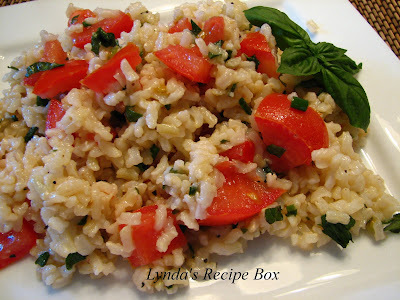 Pour dressing over rice; add chopped basil and chives and mix well. taste to check seasonings. Serve at room temperature. Serves 6. Enjoy! Wow! This looks so good to me. What a really delicious sounding rice dish. Love the idea of the vinegar with the rice. Reminds me of something my mother used to make. Delicious post. Thank you for sharing! Jury duty is really an eye-opening experience isn't it? This looks sooooo good, I love rice based dishes. How's that new granddaughter of yours doing? Oh! Love a rice salad. This is beautiful and in season - going to do this! Welcome back! Glad you're back from jury duty. Ina Garten has so many amazing recipes, but most of them are dripping with fat. She obviously doesn't care. Still, I have to watch her and I do use some of her recipes. So glad you found a healthful one. Brown rice salads are wonderful, and a great idea in this awful heat we're all having. basil is the perfect herb for this great side dish, which is easy and quite appealing. it takes a special something for me to crave rice, and your recipe has it! What a great salad. Ina's recipes are wonderful but I love to see other people's adaptions of them. Your recipe sounds delicious. I just bought some brown rice - I know what I am doing with it. looks wonderful! I've been looking for more ways to use brown rice, too... this would make a great lunch. This looks like a great side, healthy and fresh from the garden tomatoes. I will make it soon, always looking for different ways to serve brown rice. This looks like it's right up my alley--healthy and perfect for the summer!